THE RIVENDELL ROAD is the curriculum of Rivendell School. Our vision, as curriculum writers, is to launch students on a life-long adventure of discovering how to think wisely and well, to the glory of God; the Road is how we get there. We believe that if we want to teach children to explore God’s world by thinking well, we must be intentional in every aspect of our curriculum. To this end, the Road focuses on four strands into which all subject areas are woven. These strands are undergirded by the fact that we believe “Thinking Well” is the foundational mindset which impacts the development of everything we teach. The Rivendell Road provides instructional continuity and a common structure across grade levels, delineates clear learning objectives, standardizes instructional format to facilitate transferability, and offers accountability. 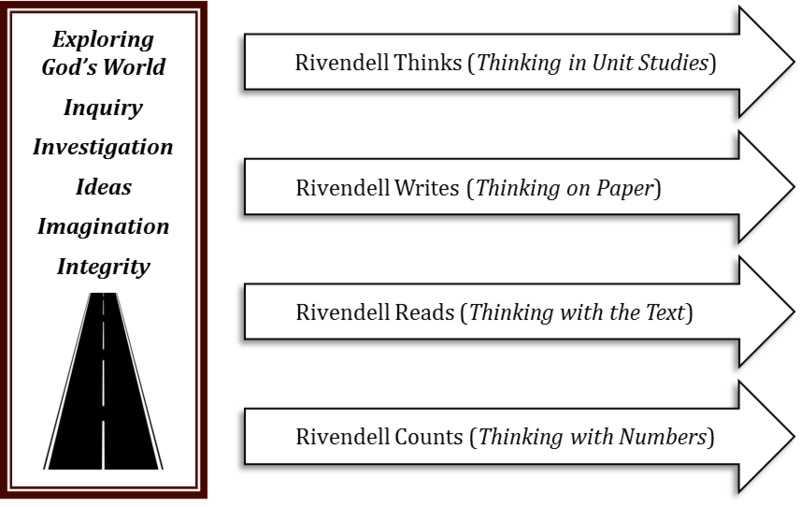 As our faculty writes the integral units of instruction, the Rivendell Road helps ensure that deep, disciplined thinking intersects with meaningful content. Learning is not only about the intellect and the development of transferrable skills, but the growth of the whole child, in preparation for a heroic journey in service to the King.